#102525 - The premium solution for your laminate needs! 102525 is the premium solution for your laminate needs. This weatherable PS Premium UV series of laminates feature a Polypropylene Gloss film with permanent, solvent acrylic adhesive was designed specifically to protect the image from harmful UV rays (sun and artificial light), moisture, abrasions, and the environment. Provides the ultimate in UV protection and outdoor durability. 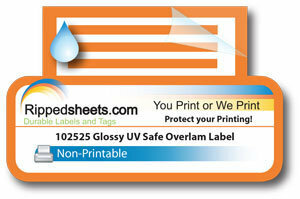 Provides effective protection for inkjet printed labels and sheets. 102525 is relatively easy and fast to apply by hand when diecut to match the printed label size.